Last week-end, we had a drive to the Swan Valley area. First intention was going to see what TheVines is. 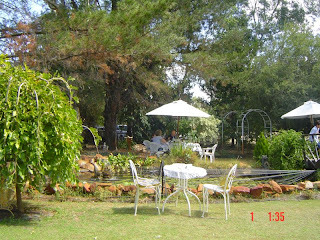 Found out that The Vines is a resort and country club with stunning native bush and lush manicured gardens. It is WA’s premier golf course. Since we both are not a golfing person, so we turned around and continued to drive further more. 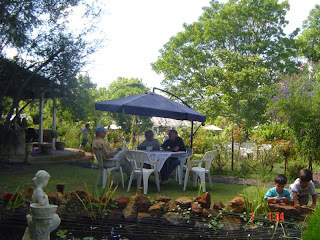 We found this place Lily of The Valley, it’s a garden cafe with beautiful old English garden setting. The place is so cosy and have space for the kids to run around. A little pond and a wooden rustic bridge add a cute scenery. Some little knick-knack things hidden somewhere in the garden make it really cute. Well, this is a sort of garden I would like to have in my backyard. The cafe serves light lunches and also a devonshire teas. It’s only open on Sundays from 11.30 til 5pm. My camera’s batery was flat ( why oh why…it’s always like that when I need it! ) so I only managed to take 2 pics. Damn! Our lunch was great, Daniel had lamb marinated with mustard seeds with basil and lime and served with scalloped potatoes. While mine was pancake filled with smoked cod fish in a parsley and mustard. We also had tea and scone with jam and butter, so yummy! I forgot my weight lose programme, suddenly. For more information, if you want to book for party or function, this is the number: 92961509.